Support and resistance identify areas of supply and demand. But what exactly is supply and demand? 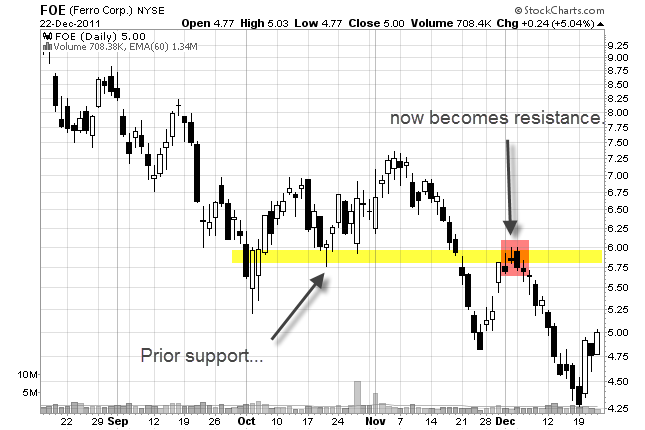 Supply is an area on a chart where sellers are likely going to overwhelm buyers causing the stock to go down. On a chart, we call this resistance. 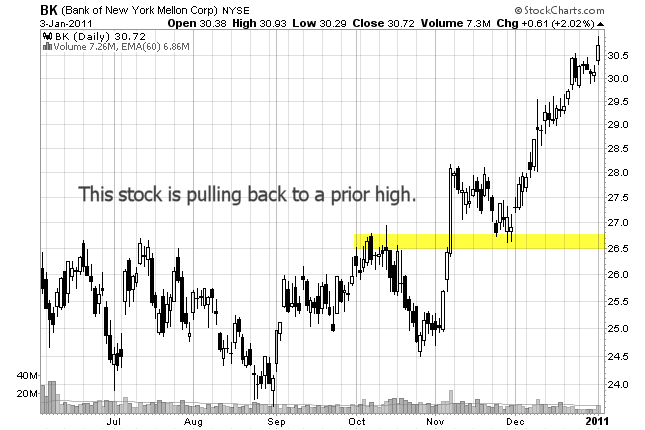 Demand is an area on a chart where buyers are likely going to overwhelm sellers causing the stock to go up. On a chart, we call this support. Knowing this, it only makes sense to buy at support and sell at resistance! Ok, you probably already knew all that but here is something that most traders do not know. 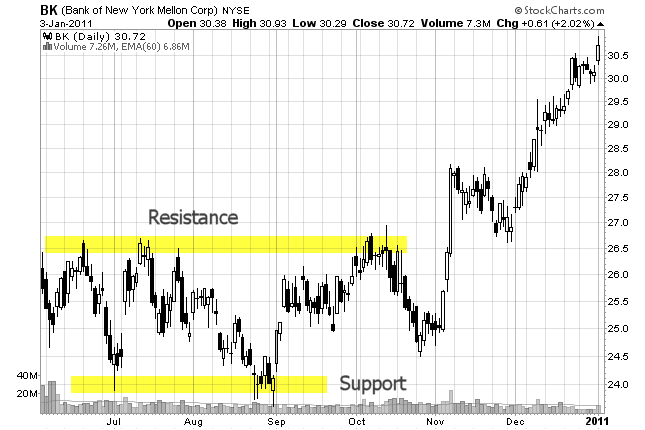 There are varying degrees of support and resistance. On the long side: When a stock falls down to a prior low it is more significant than when a stock falls down to a prior high. On the short side: When a stock rises up to a prior high it is more significant that when a stocks rises up to a prior low. This stock broke through resistance. When it pulled back, it found support at the prior high. 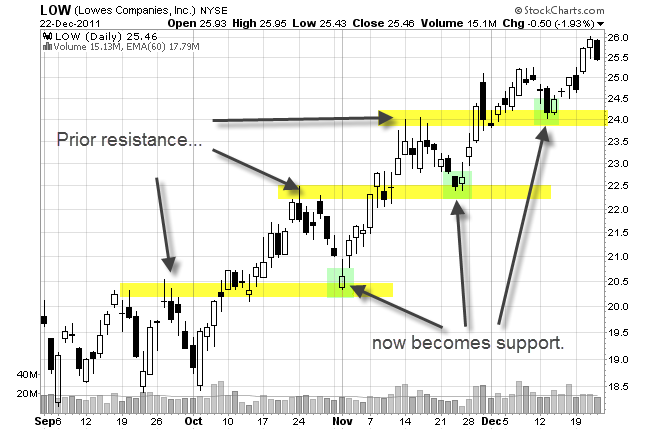 This chart shows how resistance, once broken, can become support. 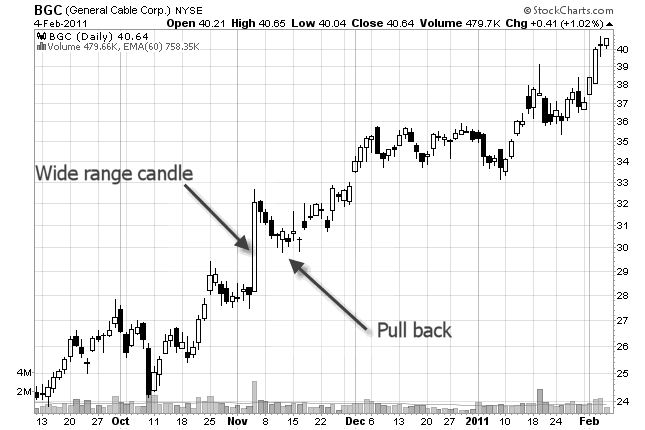 Tip: The more times a stock hits a support or resistance area the weaker it becomes (and the possibility of a breakout increases). Look back up at the previous chart. 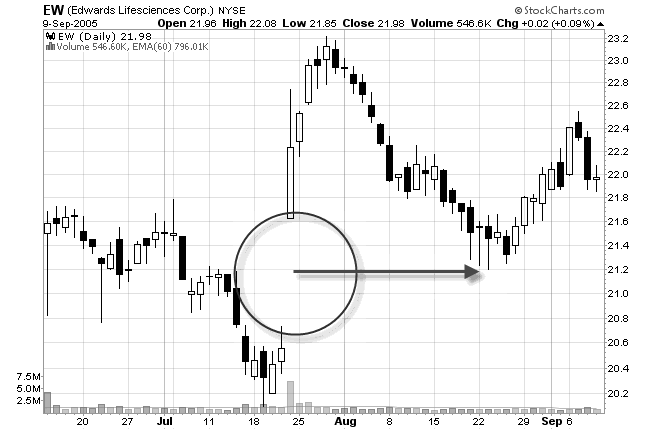 That stock hit the $26.50 area several times before finally breaking out. They do that because they are novice traders. They always buy after significant buying has already taken place into areas of resistance, and they always sell after significant selling has already taken place into areas of support. This is the opposite of what you should do! YOUR JOB AS A SWING TRADER IS TO IDENTIFY THE NOVICE TRADERS BECAUSE THOSE TRADERS ARE THE ONES YOU WILL PROFIT FROM. The highlighted area in green is where you would buy the stock. The highlighted area in red is where you would short this stock. The bottom line is that you want to be buying stocks where buyers will likely come into the stock (support). You want to be selling stocks where sellers will likely come into the stock (resistance). Novice traders do just the opposite of this. Don't follow the novice traders!